This started off being just another one of those sleepless nights spent staring at the ceiling of my room, listening to music on my ipod, and trying to sleep but knowing it will never come. As things have begun to wind down during the end of my senior I am fortunate that I have been blessed with something we so often take for granted: time. In the last month of my collegiate career I have had time to visit my family twice in one month, something I haven’t been able to do since my sophomore year. I’ve had time to laugh, to love, and to share stories with the people closest to me and the people who have mattered the most in my life. I’ve had time to bury the hatchet with old friends, lay old grudges to rest, and sit back and share a drink with the people who matter most. I’ve had time to be recognized for my achievements during my college career, and time to happily hoist a trophy over my head and share nothing but joy and happiness with my fraternity brothers after the year we thought Greek Life may come to an end. I’ve had time to look for a job while finishing up my last semester of classes, and time enough to spend with my friends and family before I leave home to start that new job, and with it, hopefully the beginning of a long and industrious career. I’ve had time to reflect on the events of the past four years and realize that some of my greatest successes have come from the jaws of my biggest failures. And I’ve had time to see that those weren’t failure, but blessings. 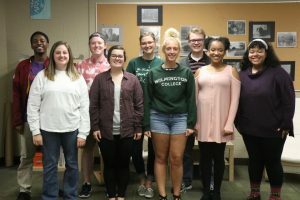 The past six paragraphs perfectly encompass what my college experience has been about, and what I’ve had time to learn during my four years here at Wilmington College. While I, like many of you, could fill a whole newspaper with rambling and complaints about how the college does things and how they could do it better, I choose not to. Why? It’s simple. Because without Wilmington I wouldn’t have had what I would consider some of the best times of my life. 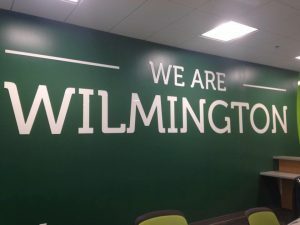 Good or bad, I would not be the person that I am without the experiences I have had because of Wilmington College and the City of Wilmington. I am so thankful for all the friends I have made, all the things I have learned, and all the things I have gotten to do that I never would have before without Wilmington. I would have never learned that Brunswick, Ohio is actually suburbia and not the farm town our high school rivals would have us believe we are. I would have never learned that hot water in the shower will agitate the grass cuts you earned playing Winkum. I would have never learned to do impersonations of Todd Murgatroyd, Bud Lewis, or Jim Reynolds to the levels of proficiency I have honed them to. I would have never learned about the importance of friendship, love, and brotherhood. I would have never learned that the only thing worse than an 8am class is the bathroom being closed for cleaning when you need that hot morning shower to wake you up. I would have never learned what a proud city Wilmington is and how it has come together, and continues to come together in times of tragedy. I would have never done half the crazy things that I did (which, in case the statue of limitations is not in effect yet, I have never done) or made the friends that I did doing it. And most importantly, I would have never written for the Witness. It has been nothing but a pleasure writing articles for this paper for the last two years, and I have found my time as a member of the Witness staff to be some of the most enjoyable I have ever spent. I would like to extend a heartfelt thank you to Corey Cockerill, who gave me the opportunity to write for this paper simply because I asked, who never told me “no,” and who always believed in me and what I was writing. I would also like to thank A.J. Ganger, who put up with my often tardy articles and always pushed me to keep writing. Finally, I would like to thank you, the readers, for heading to our website and reading all of the articles that so many of us work so hard on to inform, entertain, and communicate you. Without you, we really wouldn’t be anything. 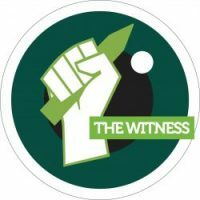 Well, this will be my last article for the Witness, maybe my last article ever. After graduation I am taking my talents to some warmer climates and starting a career in Texas. I would like to extend one last thank you to everyone who made my college career the wonderful time that it was. And with that, I say, Goodnight Wilmington. I will hold this as a special time forever in my heart. Amen Gus! Definetly spoke to me, especially with thinking about all the wrong things but not having any of the good without Wilmington either! 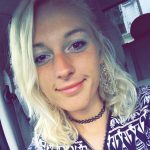 Thanks for writing this article — I’m glad that your experience here has shaped you into who you are. That’s all we can ask when we are given an opportunity like this one — you buy the ticket, you take the ride. Best of luck in Tejas (that’s the way they like for it to be pronounced — I lived in Lubbock for two years) and please keep in touch!